SINGAPORE (Kyodo) — Trade ministers from 16 countries began another round of talks Saturday to push for the conclusion of a largely Asian free trade pact before year-end. The one-day meeting at a hotel in downtown Singapore comes just after chief negotiators for the Regional Comprehensive Economic Partnership free trade agreement met earlier this week in Indonesia. At the last ministerial gathering in Singapore in August, the ministers adopted a package of deliverables that they hope to achieve by the end of this year in what would "signify the substantial conclusion of the RCEP negotiations." The package comprises four parts — goods, services, investment and intellectual property rights. The latest round will be the final intersessional meeting before the Association of Southeast Asian Nations Summit and related leaders’ meetings in November, a trade official involved with the meeting said. Negotiations for the RCEP, which would be the world’s largest free trade area, started in 2013 but have failed to meet targeted deadlines a few times. Norazman Ayob, deputy secretary general (trade) at Malaysia’s Ministry of International Trade and Industry, was quoted by the country’s The Star newspaper as saying that the ongoing trade friction between China and the United States has provided impetus for an early conclusion of the RCEP. However, Norazman said, concluding the pact by year-end is challenging due to the different levels of development among the countries involved and the political factor that some countries including India and Australia will hold general elections next year. Singapore Prime Minister Lee Hsien Loong also said in a speech at the World Economic Forum on ASEAN in Hanoi last month that achieving a substantial conclusion by the end of this year "is not yet assured." 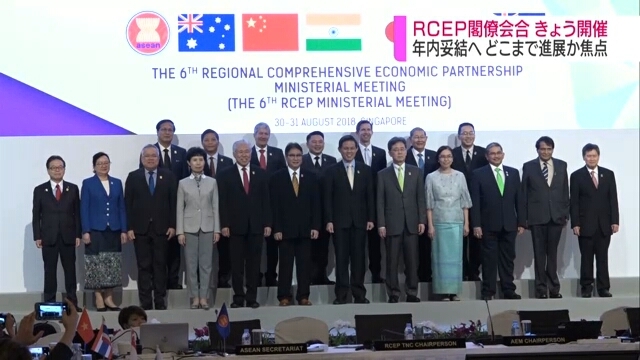 RCEP groups the 10 countries of the Association of Southeast Asian Nations — Brunei, Cambodia, Indonesia, Laos, Malaysia, Myanmar, the Philippines, Singapore, Thailand and Vietnam — plus Australia, China, India, Japan, South Korea and New Zealand.